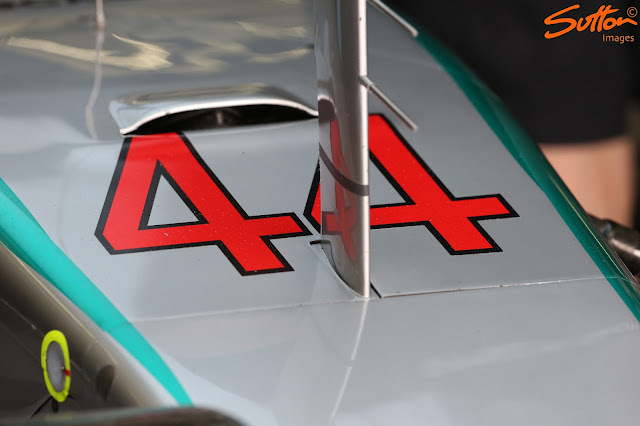 Disclaimer: This article may not end up being a typical bite size piece but that's because I'll likely have to use numerours images to explain what is being done by Mercedes to create their 'S' duct. 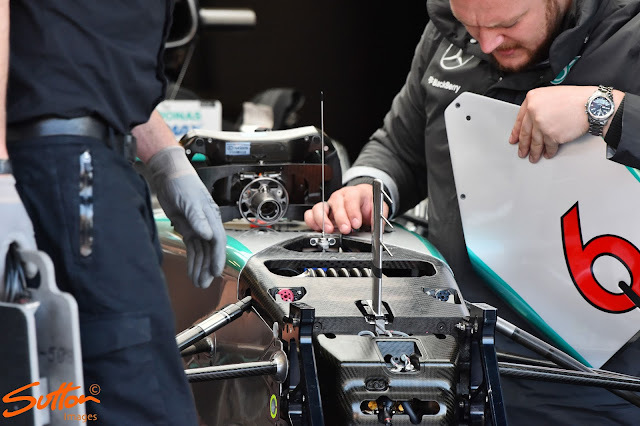 Let's start with how Mercedes version works though, as it differs from the ones currently run by Red Bull, McLaren and Force India as they don't have the classis 'S' shaped ductwork attached to the front of the bulkhead, in order to move the flow from one region to another. 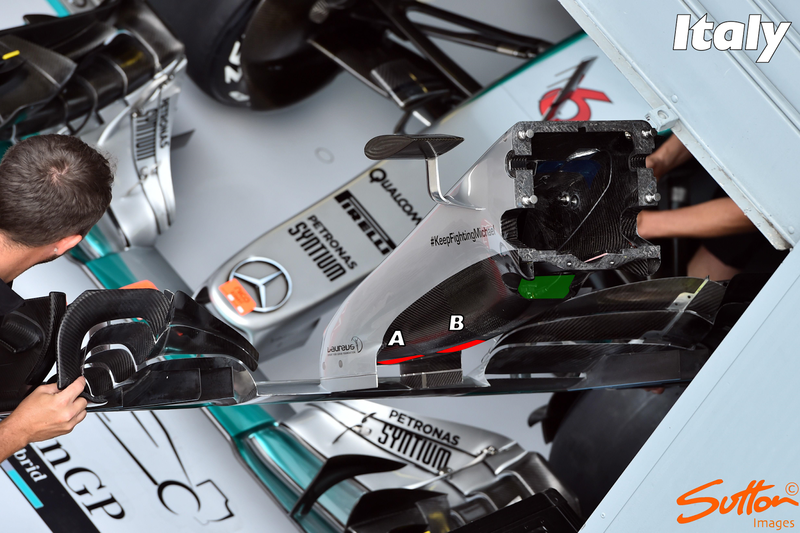 As we can see it is not a simple case of just bolting something onto the car, the three solutions seen here alongside the Mercedes chassis are elegant, integrated systems that were designed around the initial concept of the car and need other elements to be designed to suit their fitment. Most importantly the placement of the brake cylinders has to be catered for, with McLaren even moving theirs inboard the bulkhead to achieve this. 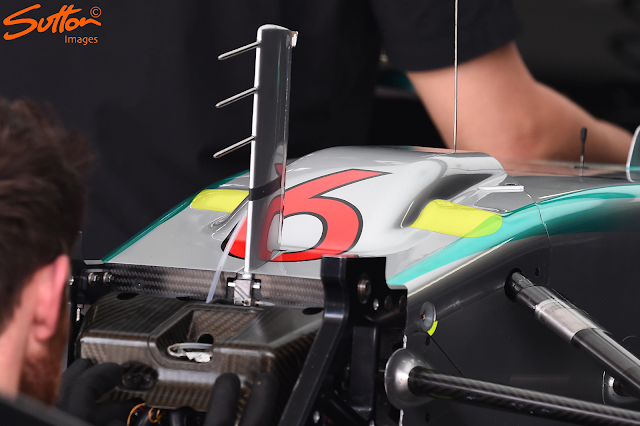 In order that Mercedes test this concept for its likely introduction on the W07 the team may have piggybacked their existing driver cooling method, so although it isn't as elegant as the aforementioned solutions it could help to validate the teams findings going into 2016. 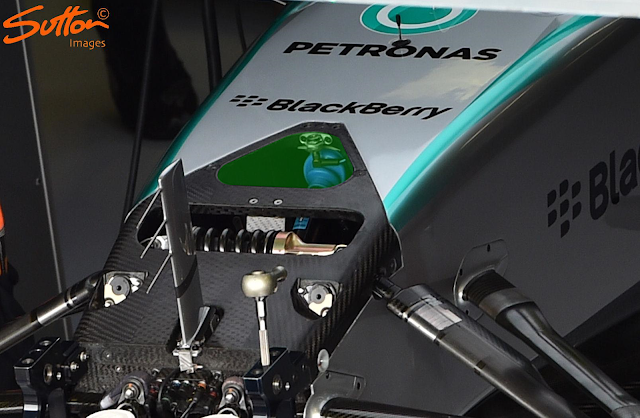 Ordinarily Mercedes run two driver cooling options, at lower speed and higher temperature circuits the team use an aperture in the vanity panel (above) which feeds air through the chassis hole used as access for the steering assembly (below and highlighted in green) then into the cockpit. Otherwise they have a slot on the underside of the chassis (see lower left) which is covered when the upper slot is used (lower left, see silver tape applied) which feeds cool air to the cockpit. 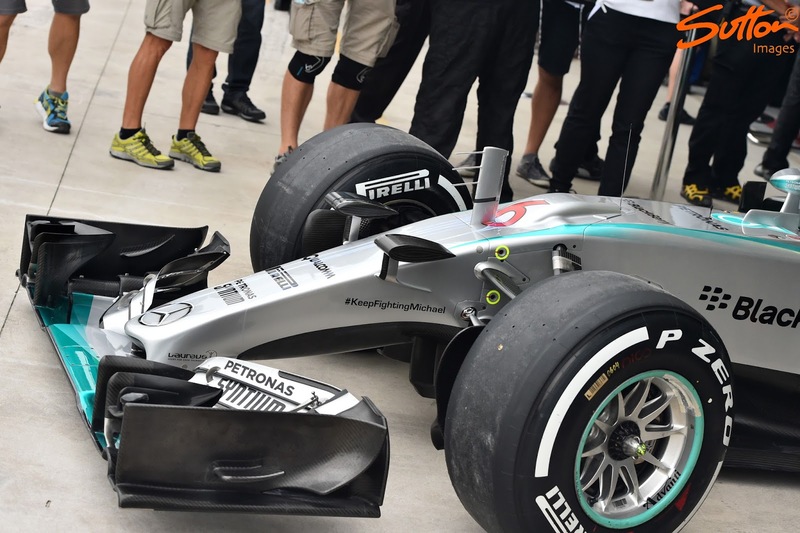 This would mean air then enters at either A or B it goes through the lower hollow section and through the slit at the bottom of the chassis, onward into the cockpit to cool the driver. 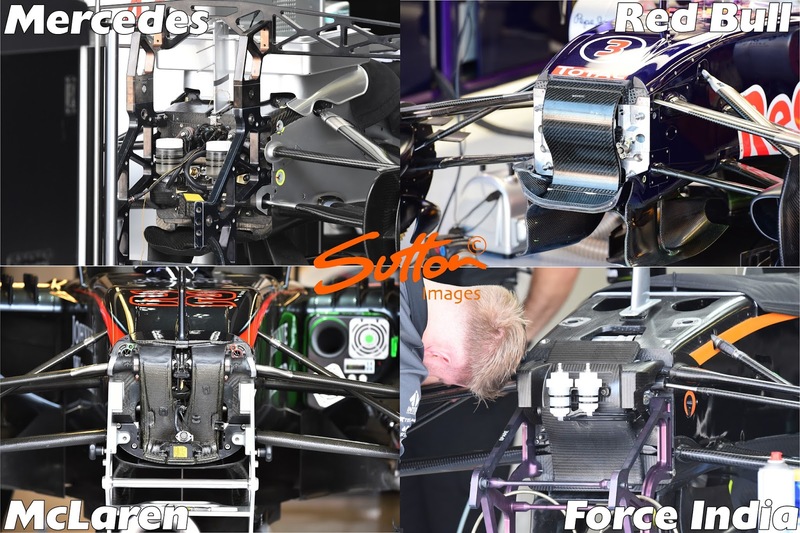 However, for this 'S' Duct experiment I'd suggest the airflow could be being sent upward instead, out through the two apertures on the top of the chassis, with the 'S' duct style vanity panel simply taking the place of the normal flat vanity panel seen in the engineers hand in the lower of the two images below. Meanwhile in the upper of the two images I have superimposed the vanity panel on the chassis image to show where things align. What strikes me about the Mercedes configuration is not just the 'S' duct configuration but the placement of the two bulges either side of the duct protrusion (highlighted in yellow below). 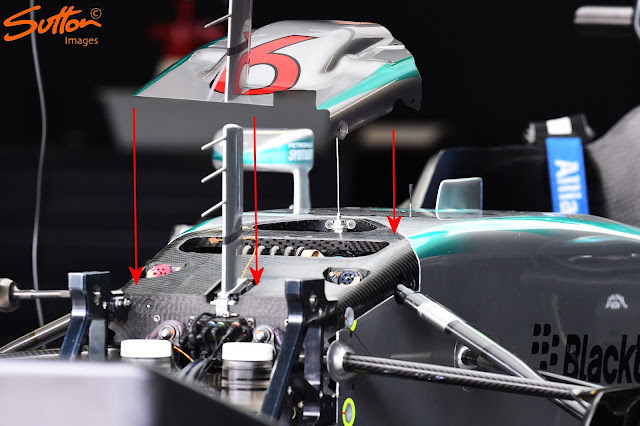 These align with the heave dampers aperture but nothing has changed with that, this to me means one of two things, firstly they may be trying to maximise the airflow coming out of the damper aperture. Secondly they are not worried that the bulge will impinge on their findings, which means they are likely looking at making geometry changes to the front suspension for next season. 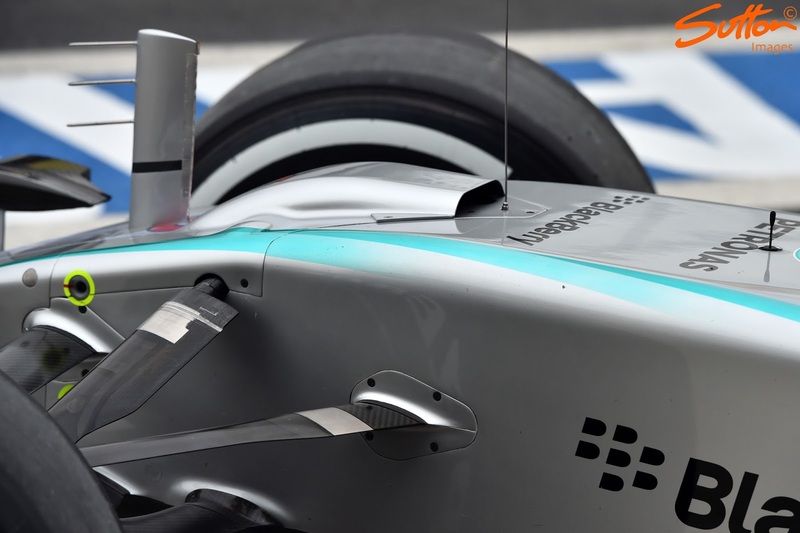 This would have an effect on how acute the angle of the nose/chassis is, of which the 'S' duct can help the airflow to overcome. 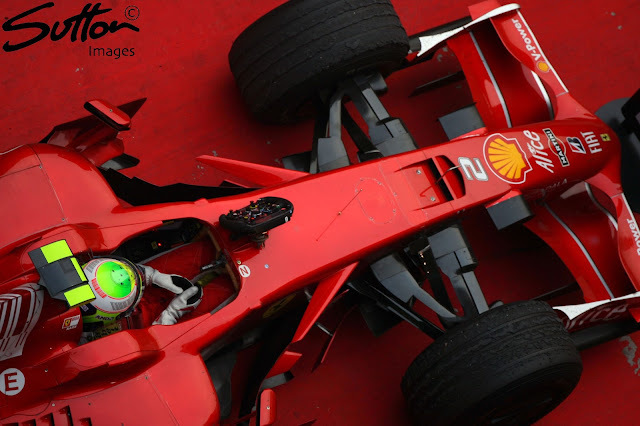 Based on the configuration this iteration of the S duct it has more in common with the nose duct employed by Ferrari on the F2008 in my opinion. Although I have given my intepretation of how airflow could move from the lower surface of the nose to the upper surface of the chassis, you should be aware that they may just be testing these components to see their aero drawbacks without everything plumbed in place.